This antibody specifically recognizes the 85 kDa fragment of cleaved PARP1 and can be used as marker for detecting apoptotic cells. Cleavage site specific antibody, unconjugated. The antiserum was produced against a chemically synthesized peptide corresponding to the N-terminus of cleavage site (214/215) of human PARP1 and will recognize Asp 214 and Gly 215. Synthetic peptide corresponding to Human Cleaved PARP1. HeLa cells treated with staurosporine at 0.5 µM for 5 hours. Purified from rabbit serum by sequential epitope-specific chromatography. The antibody has been negatively preadsorbed using a peptide spanning the cleavage site to remove antibody that is reactive with full length PARP1. The final product is generated by affinity chromatography using a peptide corresponding to the PARP1 cleavage site. Our Abpromise guarantee covers the use of ab4830 in the following tested applications. WB 1/1000. Detects a band of approximately 85 kDa (predicted molecular weight: 85 kDa). Involved in the base excision repair (BER) pathway, by catalyzing the poly(ADP-ribosyl)ation of a limited number of acceptor proteins involved in chromatin architecture and in DNA metabolism. This modification follows DNA damages and appears as an obligatory step in a detection/signaling pathway leading to the reparation of DNA strand breaks. Mediates the poly(ADP-ribosyl)ation of APLF and CHFR. Positively regulates the transcription of MTUS1 and negatively regulates the transcription of MTUS2/TIP150. With EEF1A1 and TXK, forms a complex that acts as a T-helper 1 (Th1) cell-specific transcription factor and binds the promoter of IFN-gamma to directly regulate its transcription, and is thus involved importantly in Th1 cytokine production. Required for PARP9 and DTX3L recruitment to DNA damage sites. PARP1-dependent PARP9-DTX3L-mediated ubiquitination promotes the rapid and specific recruitment of 53BP1/TP53BP1, UIMC1/RAP80, and BRCA1 to DNA damage sites. Contains 1 PARP alpha-helical domain. Contains 1 PARP catalytic domain. Contains 2 PARP-type zinc fingers. Phosphorylated by PRKDC and TXK. Poly-ADP-ribosylated by PARP2. Poly-ADP-ribosylation mediates the recruitment of CHD1L to DNA damage sites. S-nitrosylated, leading to inhibit transcription regulation activity. Nucleus. Nucleus, nucleolus. Localizes at sites of DNA damage. Proteins from cell extracts were resolved by SDS-PAGE on a 4-20% Tris glycine gel and were transferred to PVDF membrane. Membranes were incubated with either 1 µg/mL anti-PARP1 (pan) antibody or anti-PARP1 cleavage site (214/215) specific antibody at 1 µg/mL. After washing, membranes were incubated with goat F(ab’)2 antirabbit IgG alkaline phosphatase and bands were detected using the Tropix WesternStar detection method. The data show that the anti-PARP1 cleavage site specific antibody only recognizes the 85 kDa fragment of PARP1 in apoptotic cells (lane 3) and does not react with full length PARP1 (lane 1). The PARP1 (pan) antibody confirms that nonapoptotic cells express full length PARP1 of 116 kDa (lane 2) and which is cleaved when apoptosis is induced (lane 4). HeLa cells were induced into apoptosis with staurosporine at 0.5 µM for 5 hours (panel A) and were untreated as control (panel B). The cells were fixed in cold acetone for 5 minutes. Cells were incubated with the anti-PARP1 cleavage site specific antibody (CCSA) at 10 µg/mL. Cells were then incubated with biotinylated goat anti-rabbit Igs followed by ABC and DAB. The data show that the anti-PARP1 CCSA specifically recognizes PARP1 in apoptotic cells. 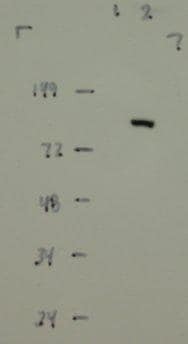 Taken together with Western blot data above, these data demonstrate the specificity of the anti-PARP1 CCSA for cleaved PARP1. Western blot - Anti-Cleaved PARP1 antibody (ab4830)This image is courtesy of an Abreview submitted by Adam Szadkowski on 26 January 2006. Publishing research using ab4830? Please let us know so that we can cite the reference in this datasheet. Thank you for contacting Abcam with this inquiry. Unfortunately the homology between the immunogen of ab52294 and bovine Caspase-3 falls below the threshold for qualification for our Abreview testing discount. Please let me know if you have any questions or there are other way in which I might help. Dear Sir/Madam The customer would like to PARP antibody that result same with the publication (page 1387, attach file) which have PARP protein and cleave form. So, please kindly recommend abcam antibody. Thank you for contacting us. We have several antibodies which can be used to detect PARP in Western blotting. From the study I believe you wish to detect both the cleaved (C-terminal fragment) and the full length PARP form in mouse samples? This can be done using ab75757 (Chicken polyclonal) or ab37722 (Rabbit polyclonal). Although ab37722 has not been tested with mouse samples due but to the similarity in immunogen sequence (100%) it is predicted to react. If however you are interested in human samples this can be achieved with ab32071 (Rabbit monoclonal [E78]) which was raised against a synthetic peptide of the C-teminal residues of human PARP. Please note this antibody does not react with mouse samples. We also have several antibodies that specifically recognise the cleavage product of PARP such as ab4830 (reacts with human C-terminal PARP) and ab32064 (reacts with mouse and human PARP, N-terminal). I hope this information is helpful to you. Please do not hesitate to contact us if you need any more advice or information. I'm sorry to hear you are having a problem with ab4830. I did have a question about the samples you used. What kind of cells did you test? Were these treated to induce apoptosis? This antibody will only detect cleaved PARP, so if the cells are not apoptotic, the protein will not be detected (please see the second Western blot image, where the uninduced cells show no band, and the induced show a very nice band). The rest of the protocol looks fine to me. It may just be that the sample you are using is not supposed to have cleaved PARP. Please let me know if this helps and do not hesitate to contact us for further advice.